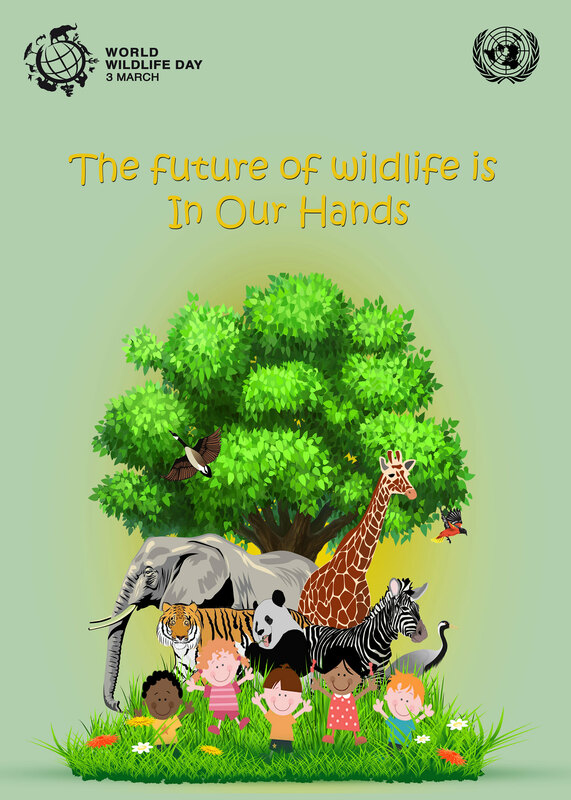 The UN World Wildlife Day is an international celebration of the many beautiful flora and fauna of the world. It is also an event to raise awareness of the benefit of conservation. #WWD2016 is celebrated on 3rd March, the day the Convention on International Trade in Endangered Species of Wild Fauna and Flora (CITES) was adopted in 1973. 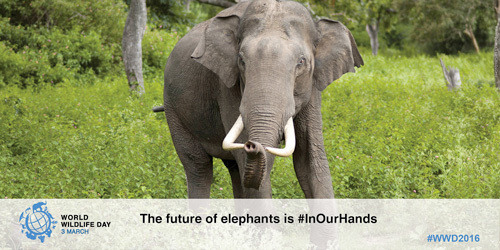 This year’s theme is “The future of wildlife is in our hands”, with a global focus on the conservation of African and Asian elephants through its subtheme. World Wildlife Day will be celebrated all around the world with main events at the UN Headquarters at New York. The world’s wildlife, whether charismatic or lesser known, are facing many challenges . The biggest threats to wildlife are habitat loss due to cattle ranching, agriculture and development . Poaching and trafficking in wildlife pose the most immediate threat to many iconic species too. Elephants, pangolins, rhinoceros , sharks, tigers and precious tree species are among the most critically poached and trafficked species across the world. About 100,000 elephants were slaughtered for their ivory between 2010-2012. While we are seeing positive progress in tackling illegal wildlife trafficking, there is still more that needs to be done. On this World Wildlife Day, UN hopes to see even more commitments from countries and citizens around the world to ensure the survival of this species. Governments, law makers, enforcement officers, customs officials and park rangers across every region are scaling up their efforts to protect wildlife. Everyone has a role in protecting wildlife and its habitat. Our collective conservation actions can be the difference between a species surviving or disappearing. Until recently, it was commonly believed that there were just two species of elephant in the world; the African savanna elephant (Loxodonta africana) and the Asian elephant (Elephas maximus). However, after extensive studies and DNA testing, it has been discovered that there is a third distinct species; the African forest elephant (Loxodonta cyclotis) but CITES still includes the forest elephant as an African loxodonta subspecies (Loxodonta africana cyclotis). The Asian elephant which is found across 13 countries on both the Asian mainland and a number of islands, is rated as endangered (EN) in the IUCN Red List. Asian elephants differ from Africans in a number of ways and studies have divided this species into four sub species. Elephas maximus indicus is sometimes mistakenly called the Indian elephant, is found across continental Asia as far as China and Vietnam; it should be correctly termed the Asian elephant. Asian elephants are smaller than African ones, with noticeably smaller ears. Only some male elephants have tusks but some females have small tushes. Elephas maximus maximus, or the Sri Lankan elephant, is the largest of the Asian elephants. However, Sri Lankan bulls appear less inclined to growing tusks. This subspecies is only found on the island of Sri Lanka. However, Sukumar (2006) cited evidence from molecular genetics which do not support the differentiation of the Sri Lankan population from those on the Asian mainland. Elephas maximus sumatranus, or the Sumatran elephant, is only found on the Indonesian island of Sumatra. It is the second smallest of the Asian elephants. Elephas maximus borneensis, or the Bornean elephant, was only classified as a separate sub species in 2003 after tests revealed differences in the genetic makeup from mainland elephants. The Bornean elephant is the smallest of the sub-species and sometimes referred to as a pygmy elephant and are only found on the island of Borneo. Ivory poaching for tusks is the main reason that elephants have been so heavily hunted. Elephant ivory has been used in huge amounts to make billiard balls, piano keys, identification stamps and many other items for human enjoyment. Items carved out of ivory have always carried a high value and considered as collectibles and valuable treasures. Although hunting for ivory has been much more severe in Africa, there is no doubt that hunting and poaching has had an effect on the elephant numbers in Asia. In 1989, the Convention on International Trade in Endangered Species (CITES) banned the ivory trade putting hunting outside the law. In Peninsular Malaysia, the species is still widely distributed in the interior of the country in the following States: Pahang – which might have the largest population, Perak, Johor, Kelantan, Terengganu and Kedah. The current elephant population in Peninsular Malaysia is estimated at 1223-1677 individuals (Salman S et al. 2011). In Borneo, elephants only occur in the lowlands of the northeastern part of the island in Sabah and adjacent parts of Kalimantan, Indonesia. In Sabah, survey by Alfredt et al. (2010) indicated 2,040 elephants which remain in 5 ranges with the largest population being in the unprotected forests. Executive Director of the United Nations Environment Programme (UNEP), Achim Steiner posted a video urging all nations and people to be more informed and more involved in stopping the crime against nature. Poaching and the illegal trade in wildlife have reached unprecedented levels. Steiner claims that in the last few years, over 100,000 elephants were poached in Africa. The trend is also rampant with Asian Elephants where also some rhino populations face extinction. Though levels of poaching have been lower in Asia, because only male Asian elephants have tusks, proportions of their population are being dramatically reduced in some regions. Habitat loss and fragmentation due to agriculture and development is the biggest threat to the continuing survival of Asian elephants. The main cause of the loss of the natural forest is pressure from human population growth. Human settlements and agricultural encroachment near the ranges of the elephants habitat increases the pressure on elephant habitat. Shortage of food in fragmented forests corresponds to crop raiding and often result in damages to human settlement and agricultural crop. Elephants and humans have come in increased contact which leaves them in conflict most of the time. In 2012, a five-year State Species Action Plan for the Bornean Elephant was launched to provide a platform for better protection of the three flagship species in Sabah ; which are Orangutan (Pongo pygmaeus morio), Bornean Elephant (Elephas maximus borneensis) and Sumatran Rhinoceros (Dicerorhinus sumatrensis harrissoni). The Bornean Elephant action plan is designed comprehensively for immediate, practical and adaptive conservation actions in order to ensure the long term survival of the species. The five year goal of the species action plan are to identify, develop and implement strategies and actions that will address the threats to the species in all priority populations identified in the State by providing guidance to key players that will implement these strategies. The plan was developed by Sabah Wildlife Department (SWD), HUTAN-Kinabatangan Orang-utan Conservation Project, Borneo Rhino Alliance (BORA) and Danau Girang Field Centre (DGFC). The Malaysian Palm Oil Council and the Malaysian palm oil industry is playing their role diligently for the success of this action plans through many collaborations and conservation efforts. Under the Malaysian Palm Oil Wildlife Conservation Fund (MPOWCF) and collaboration with Sabah Wildlife Department (SWD), funds were allocated for the establishment and operation of Wildlife Rescue Unit (WRU). With highly trained rangers and wildlife personnel, WRU were involved in capturing and translocating elephants to a better wildlife sanctuary for protection and conservation. 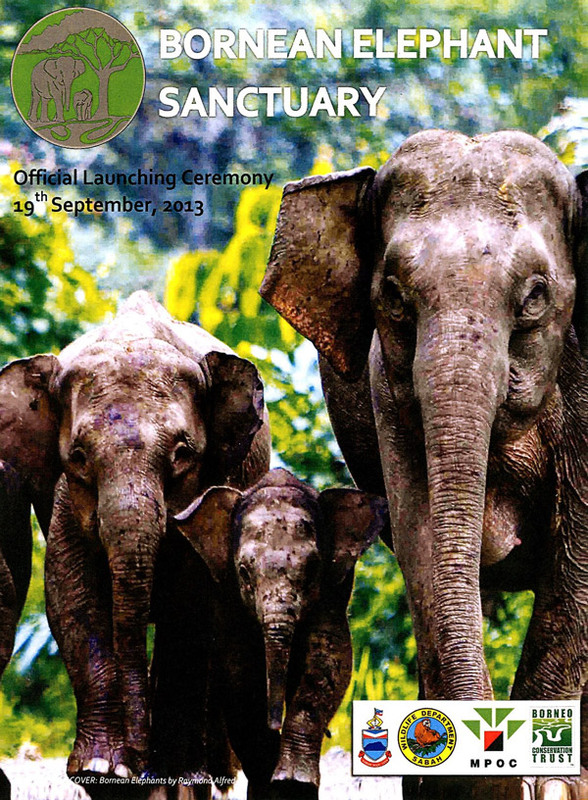 Sabah’s first and only Bornean Elephant Sanctuary (BES) was officially launched on 19th September 2013. It was designed specifically to provide refuge for rescued elephants that have been injured or orphaned. The rescued elephant will be cared for and rehabilitated before being released back to the wild. The Sanctuary is located at Lot 8 of the Kinabatangan Wildlife Sanctuary covers 1,214 hectares with a built-up area of 25 hectares. Construction of the full facilities is still in progress. Malaysian Palm Oil Council (MPOC) is the major and prime funder for the BES while sharing Sabah Wildlife Department’s vision for wildlife conservation. MPOC has pledged RM5.2 million for the development of BES from its Malaysian Palm Oil Wildlife Conservation Fund (MPOWCF), of which RM500,000 was used in phase one. Borneo Conservation Trust, BCT Japan and its 12 corporate partners, including Asahiyama Zoo and Saraya Corporation, have also provided RM1.6 million in funds to date. Malua Wildlife Habitat Conservation Bank (MWHCB) was established after several wildlife census and expeditions revealed, that Malua Forest Reserve provides habitat for breeding populations of 16 IUCN red listed mammals and birds species including Orangutan, Borneon pygmy elephants, Sumatran rhinoceros, Borneon banteng and other iconic species. 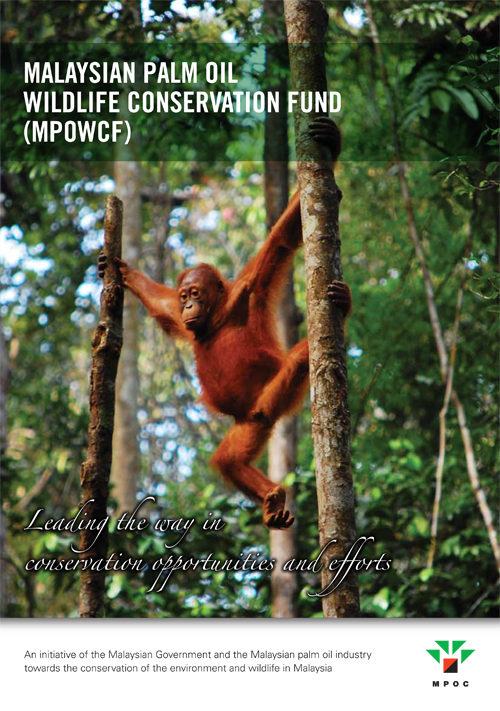 The Malua Partnership Wildlife Conservation Agreement was established to create a conservation partnership between the public sector and the oil palm plantations around Malua Forest Reserve, based on a common vision of nurturing a symbiotic relationship with the environment. The agreement was based on key research outcomes from studies funded by MPOWCF in 2013. Activities and programs during World Wildlife Day concentrates in creating awareness among the general public and business corporations and calls for more funding and contribution for the protection and conservation of Elephants. Such events reminds us on the effort and role of many leaders and also each and every efforts and gesture brought by every individual, organization or corporations pushes the species away from the brink of extinction and gives hope for a better future for the Elephants and mankind. Our responsibility is to look after wildlife. On March 3rd, World Wildlife Day is a call to become more informed and more involved in stopping this crime against nature, communities and future generations. 2. Ambu L. & Goossens B. (2010). Sabah Wildlife Department & 10 Years Research: Towards Better Conservation of Sabah Wildlife. Online Journal of Oil Palm & Environment 2012, 3: 38-51. 6. R. Sukumar (2006) A brief review of the status, distribution and biology of wild Asian elephants, Elephas maximus. Centre for Ecological Sciences. Indian Institute of Science. The Zoological Society of London International. 200 Yb (2006) 40: 1-8. 7. Salman Saaban, Nasharuddin Bin Othman, Mohd Nawayai Bin Yasak, Burhanuddin Mohd Nor, Ahmad Zafir and Ahimsa Campos-Arceiz (2011) Current Status of Asian Elephants in Peninsular Malaysia. Department of Wildlife and National Parks, Kuala Lumpur, Malaysia. Gajah 35 67-75.